Like most people I have loved Disney films ever since I was a child. The Little Mermaid is without a doubt my all time favourite Disney film, I remember going to see it at the cinema when it first came out and when I went to Florida a year later all the parade was The Little Mermaid theamed. I especially adore the much loved 'Part Of Your World' song that Ariel sings. I know all of the words and sing along whenever I hear it, which is quite often these days as my three-year-old daughter, Sophia has also taken a bit of a shine to The Little Mermaid film too. 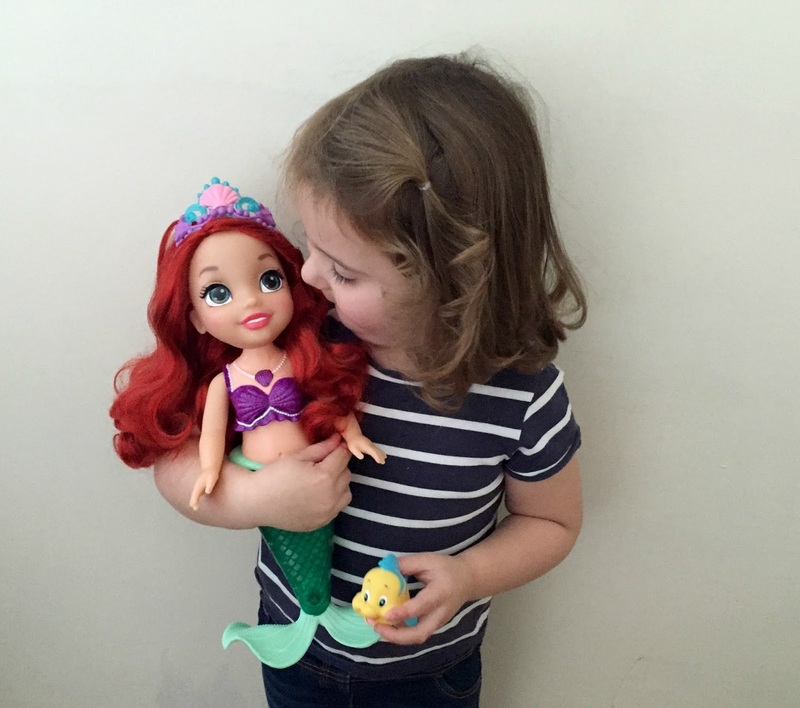 Recently Sophia was lucky enough to be sent the all new Little Mermaid Ariel Colours of the Sea bath time doll, from Jakks Pacific (recommended for children aged 3 +). 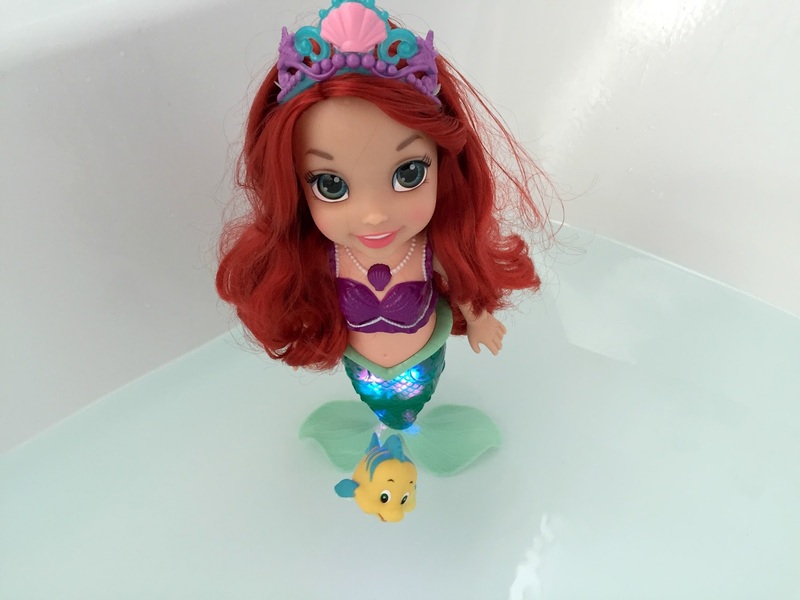 Before we were sent this doll I had seen it advertised and thought that it looked great for Little Mermaid fans and just knew that it would be a bath time hit, as it is not like any of the other bath toys that we own. When Ariel arrived Sophia's little face lit up and she could not wait to get her out of the box. The first thing I noticed was that Ariel was quiet big, the same style and size as the Disney Toddler dolls we reviewed earlier in the year. 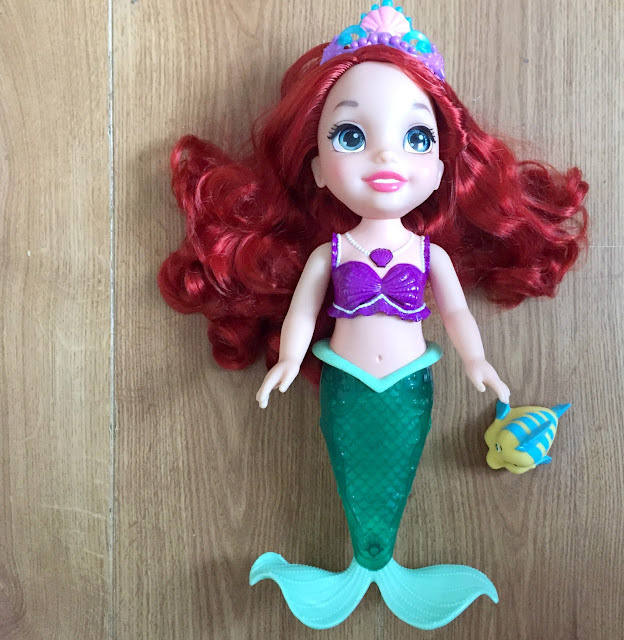 Ariel comes complete with her best friend Flounder the fish, who is a little squirty bath toy. Unlike other bath toys Ariel sings and her mermaid tail lights up and changes colour, even under the water, although she does obviously sound quieter under the water. The doll requires three AAA batteries, luckily these are included so you can play with Ariel straight away. If you press her necklace she will sing Part Of Your World and she also says 14 different phrases, when you put her tail into the water she will start singing Part of Your World and her tail will light up and change colours. You do need to activate all her phrases and song by submerging her tail in water to get her to say all her phrases and sing her song for longer though. You can also turn the switch on her back to change her to speak in Spanish rather than English if you wish. Even when Ariel is under the water you can still see her brightly light tail and hear her singing and speaking. I was a bit apprehensive about submerging Ariel in the water as her hair was so amazing and I thought that it would be ruined after getting wet. I was pleasantly surprised to find that it sort of goes back to the normal style though when it drys, just not as glossy. Overall we were were really impressed with Colours of the Sea Ariel, she has a RRP of £34.99 which may seem a little steep at first for a bath toy, however after seeing how big, well made and lovely Ariel is I think she is worth it. My three year old totally loves her and does not want to come out of the bath when she is playing with her. Ariel will make the perfect bath time companion for any Little Mermaid fan. We have made a little video below showing what Ariel is like in the bath, excuse my little girl babbling away in the background she was just so excited to play with Ariel. Disclosure We were sent this Colours of the Sea Ariel doll for the purpose of this review, however all opinions are my own. I've seen this around and the doll looks fab! T would love this too. My little girl would love this doll. Will check it out.